Cuvette, 200 - 900 nm Mobile Design. Spectroscopy can now be taken anywhere. 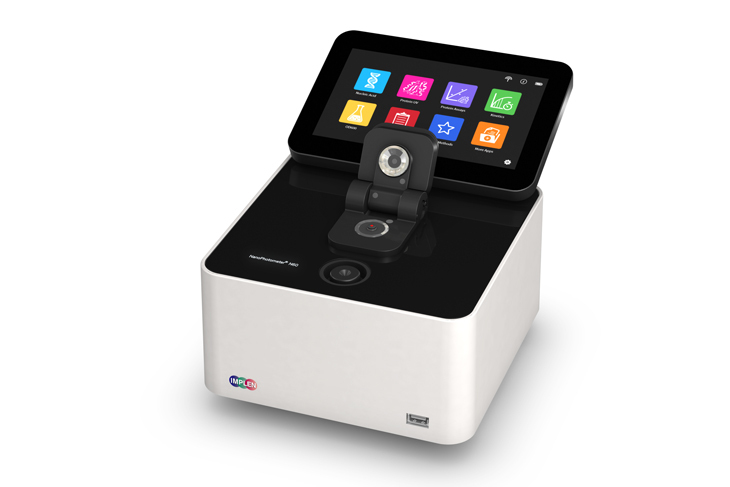 Best in class cuvette spectroscopy with the convenience of a lightweight portable instrument with a built-in 7 inch LCD glove compatible touchscreen with flexible unit control options. ⇒ with Implen?s DiluCell? 10 or DiluCell? 20 facilitates the measurement of low volume samples (volume requirement of 200 ?l and 100 ?l respectively). The two different available DiluCell? 10 and DiluCell? 20 versions allow for automatic 1/10 and 1/20 dilutions. With a bandwidth of 40 nm, the OD600 is also suitable for protein quantification assays like Bradford (595 nm). The small size and portable nature of the OD600 DiluPhotometer? make it convenient for use in incubation cabinets and under anaerobic conditions. The NanoPhotometer® and OD600 DiluPhotometer™ can be made even more Convenient with a wide variety of optional accessories specifically designed to be compatible with each instrument. ⇒ path-lengths that can be utilized with the sub-microliter cell to provide virtual sample dilution including 2 mm, 1 mm, 0.2 mm, 0.1 mm and 0.04 mm. ⇒ sample volume requirements and bubble free filling, the DiluCell™ allows for convenient spectrophotometric analysis from 340-1100nm. ⇒ Built-in vortex provides sample uniformity for the highest degree of accuracy with the smallest sample volume with as little as 0.3 ?l. Illuminated quartz sample surface allows for easy sample application. ⇒ for the highest degree of accuracy with the smallest sample volume with as little as 0.3 ?l. Illuminated quartz sample surface allows for easy sample application. ⇒ volume with as little as 0.3 ?l. Illuminated quartz sample surface allows for easy sample application. ⇒ is the ultimate in field research. ⇒ continued operation are installed and in place. The qualification process also ensures that the instrument is operating correctly. The IQ/OQ package consists of certified tools and software to help achieving compliance with GLP/GMP guidelines set by government authorities like the Food and Drug Administration (FDA).